Edward F. Grabenstein – Edward Frederick Grabenstein, 85, a retired farmer, died early this morning at his home on RD 5. Born in Allegany County, he was a son of the late Justus and Margaret (Monday) Grabenstein. He was a member of the St. Ambrose Catholic Church, Cresaptown, and Holy Name Society of the parish. His wife, Mrs. Josephine (McKenzie) Grabenstein, preceded him in death. Surviving are four sons, James E., Joseph A., John R. and Edward C. Grabenstein, all of this city; two daughters, Mrs. James Elrich, city, and Mrs. Mary Spies, Cresaptown; two brothers, Frederick and George Grabenstein, city, and two sisters, Mrs. Anna Laing and Miss Catherine Grabenstein, city. The body is at the Stein Funeral Home. A requiem mass will be celebrated Friday at 9 a.m. at SS Peter and Paul Catholic Church with interment in the parish cemetery. A service for Mrs. Elizabeth Amelia May Grabenstein, 69, of RD 4, Oldtown Road, who died Friday in Sacred Heart Hospital, will be conducted today at 2:30 p.m. in the Scarpelli Funeral Home with Rev. William Moody and the Rev. Sadie Triiplett officiating. Interment will be in St. Mary's Cemetery. Pallbearers will be Al Martin, George E. Rose, Richard Renotas, George W. Rose, Lawrence Rose and Donald Rose. CUMBERLAND - Joseph T. Grabenstein, 74, of Cumberland, died Thursday, June 7, 2007, at his home. Born Oct. 27, 1932, in Bedford, Pa., he was the son of the late Alphonsus J. "Pete" and Lenoria A. (Heming) Grabenstein. He was also preceded in death by his wife, Mary (Platter) McKenzie Grabenstein; and one sister, Anna Gilpin. Mr. Grabenstein was a 1952 graduate of Fort Hill High School. He was a U.S. Army veteran serving in Germany as a first cook from 1953 to 1956, and he was a mess steward for the U.S. Army Reserves in Cresaptown from 1956 to 1973. Presently, he was a driver for Ford Garage, Timbrook, Enterprise and Queen City Motors. He was a member of Annunciation of Our Lord Catholic Church, Fort Ashby, W.Va., and a former commander of the V.F.W., Fort Ashby. Surviving are one daughter, Gail L. Kenner and husband Ed, Frostburg; one brother, Ronald V. Grabenstein and wife Betty, Cumberland; a special friend, Rose Marie McAlpine, Lonaconing; six nieces and six nephews. Friends will be received at the Scarpelli Funeral Home, P.A., 108 Virginia Ave., Cumberland, (http://www.scarpellifh.com) on Friday from 2 to 4 and 7 to 9 p.m. A Christian Wake service will be conducted Friday evening. Mass of Christian Burial will be celebrated at the Annunciation of Our Lord Catholic Church Saturday at 1 p.m. with the Rev. Leonard A. Smith as celebrant. Interment will be in Fort Ashby Cemetery. Graveside military honors will be accorded by the Combined Veterans Honor Guard. Mrs. Josephine Grabenstein, wife of Edward Grabenstein, died at her home on Winchester road, Saturday afternoon. Besides her husband she leaves the following children: Mrs. Clara Enrich, James and Joseph, this city; Miss Mary, John and Edward, at home; and three sisters, Mrs. Lizzie Seaders, Mrs. Rose Leasure, and Mrs. Ida Ruthmeire. and one brother, Joseph A. McKenzie, this city. Mrs. Grabenstein was a member of the third order of St. Francis of SS. Peter and Paul Catholic Church. Mr. Justus Grabenstein, one of the oldest farmers in the county, died yesterday morning at his home on the Baltimore pike, five miles east of here, aged 76 years. He suffered from a tumor, but uremic poisoning was the immediate cause of death. Mr. Grabenstein was a native of Windenhausen, Germany, but he had lived in this section nearly all his life, coming here in 1854. He was a successful farmer and all his sons, with four exceptions, are prosperous farmers in this locality. He is survived by his wife and thirteen children, 12 being married. His sons are Julius, William H., Frank, John, Joseph, Edward, Sebastian M., Frederick J., and George Grabenstein, and his daughters, Mrs. Anna Laing, Mrs. Mary Goeliner, Mrs. Francis Naughton, and Miss Katie Grabenstein, the latter residing at the paternal home. Mr. Grabenstein was the father of 15 children, two being dead. Of the surviving sons, Joseph Grabenstein is a contractor residing on Columbia Street this city; William H. Grabenstein, a miller with the Cumberland Milling Co., and Frederick J. Grabenstein, butcher with J.T. Mattingly, and Sebastian M. Grabenstein, grocer on Baltimore avenue. The funeral will take place on Wednesday morning at 10 o'clock from SS Peter and Paul church and interment will be in the church cemetery. 23 Nov 1915 - Mrs. Margaret Grabenstein, aged 80 years, widow of Justus Grabenstein, died yesterday at her home, 30 Marion Street, of paralysis, after a year of illness. She formerly lived six miles out on the Baltimore Pike where she celebrated her 50th wedding anniversary only eight years ago. Mr. Grabenstein died 2 years later. These children survive: Julius, Frank, William, John, Joseph, Edward, Frederick, Sebastian; and George Grabenstein; and Mrs Henry Swan; Mrs. Joseph Goeller; Mrs. Edward Naughton and Miss Katherine Grabenstein. Services and burial at SS Peter & Paul Catholic Church. Mrs. Rose A. Grabenstein, 62, of 215 Central Avenue, died this morning at her residence after an illness of two weeks. Born July 24, 1889, in Carlisle, Pa., Mrs. Grabenstein had lived here 18 years. Her parents were the late Simon and Stella (Thomas) Smith. She was a member of St. Mary's Catholic Church, the Sodality of the Blessed Virgin Mary and the Catholic Daughters of America. Mrs. Grabenstein is survived by two daughters, Mrs. C. Eugene Howell, and Mrs. William J. Hay, this city; two sisters, Mrs. Agatha G. Smith and Sister M. Frances Ro?? C.S.C., both of Washington, and five grandchildren. The body was taken this afternoon to the Howell home at 123 Pennsylvania Avenue. Sebastian A. Grabenstein, 75, retired grocer who operated a store on Goethe street for approximately 40 years, died early yesterday afternoon at his home, 31 Marion street, after an illness of a year. Mr Grabenstein, a native and life-long resident of Cumberland was the son of the late Justus and Margaret (Mundy) Grabenstein and was a member of SS Peter and Paul Catholic Church and the Holy Name Society of the church. Surviving are two daughters, Miss Lucy Grabenstein at home and Mrs C K Straub, Cumberland; two sons, F DeSales Grabenstein, Baltimore and Lt Joseph S Grabenstein, Fort Gordon Johnston, Fla; five brothers: Frank, Fred, John, Edward and George Grabenstein, all of Cumberland; four sisters: Mrs Mary Gellner, Mrs Anna Laing, Mrs Frances Naughton and Miss Catherine Grabenstein, all of Cumberland and three grandchildren. Funeral arrangements have not been made. WILLOUGHBY, Ohio — Mrs. Marcella Grable, 71, wife of Joseph Grable, died last night after being in ill health several months. A native of Frostburg, she was a daughter of the late Peter and Margaret (Eagen) McGuire. Also surviving are two sons, Joseph Grable, Willoughby, and Francis Grable, Euclid, Ohio; three sisters, Mrs. George Tipping and Mrs. Emmet McAteer, both of Frostburg, and Mrs. Marie Maxey, Cleveland; three brothers, Leo McGuire, Cleveland: and Emmet McGuire and Joseph McGuire, both of Frostburg, and five grandchildren. The body is at the Moreal Funeral Home, Willoughby. Services for Mrs. Ada Grace, 68, wife of Floyd P. Grace, RD 1, Short Gap, who died Saturday in Beckley, W. Va., were held yesterday at the George Funeral Home. Rev. J. H. Lotspeich, Parkersburg, a former pastor of Fort Ashby Methodist Church, officiated and interment was in Fort Ashby Cemetery. Pallbearers were Charles Malone, Clarence Betson, Franklin Ward, Floyd Umstot, Richard Pownall and Virgil Dyer. Survivors include a sister, Mrs. May Garter, Pittsburgh; a half-brother, John Noonan, Pittsburgh, and her step-parents, Mr. and Mrs. Howard Noonan, Piedmont. Cumberland. - Carl, aged 11 years, son of Whilliam H. Grace, died yesterday from injury to the head sustained in rolling off a lumber truck belonging to his father's mill, near Frankfort, W. Va., a few miles south of here. A rolling log carried him off. Mrs. Kittie Grace was called to Spring Gap Thursday by the death of her grandson, Carl, the eleven year old son of Mr. and Mrs. Will Grace. The little boy was riding on a logging truck when the accident occurred. PATTERSON'S CREEK NEWS May 15 - Carl Clarence, the second son of Mr and Mrs Will Grace, of Short Gap, who fell from a loaded wagon on the third of April and hurt so badly that he died the next day was buried at Frankfort on Friday the 5th, was eleven years, three months and nine days old. He was a good boy, liked by every one who knew him; loved his Sunday school and church, and was always in his class. He will be missed everywhere. The funeral sermon was preached in the church at Short Gap by Rev. G. W. Yost. The flowers, carnations and roses, were many and beautiful. He leaves his parents, two sisters and four brothers, besides a host of other relatives, to mourn their loss, but not without hope of a happy reunion some day in that bright and happy home where sickness and sorrow never come. Dewayne G. Grace, 30, of Short Gap, was found dead Monday morning in a wooded area of the family farm on Long Road near Frankfort High School. Born in Cumberland, he was a son of the late James Earl and Iona M. (Clark) Grace. He was a member of First Baptist Church, Fort Ashby, an employee of the Chessie System and a member of the Brotherhood of Maintenance of Way Employees. Surviving is a sister, Mrs. Earlene V. Hott of Star Route 1, Fort Ashby. The George Funeral Home is in charge of arrangements. Services will be conducted tomorrow at 1 p.m. in First Baptist Church, Fort Ashby. The Rev. Meridith C. Shryock and the Rev. Chester Fisher will officiate. Interment will be in Fort Ashby Cemetery. Mrs. Emma Grace, 67, died early yesterday at her home in Short Gap, W.Va., about six miles south of Cumberland. She was the daughter of the late James H. and Mary C. Long, and a member of Wesley Methodist Chapel. Mrs. Grace is survived by her husband, William Homer Grace, and the following children: Floyd P. and John H. Grace, of Short Gap; C. Homer, of Ashland, Ky.; Earl J., of Narrows, Va.; Raymond W., of Ridgeley, W.Va.; and Olive V. Grace, at home. Mrs. Grace was a sister of Mrs. Mollie Cook and Miss Betty Long, of Vandergrift, Pa.; Charles Long, Wiley Ford, W.Va.; Joseph and John Long of Patterson Creek, W.Va.; Tilden J., Short Gap; and Clayton Long, of Fort Ashby, W.Va. Funeral services will be held Thursday with the Rev. Charles Ambrose of the Trinity Methodist Church, Fort Ashby, officiating. Floyd P. Grace, 65, of Short Gap, died yesterday at his home after an illness of two years. Mr. Grace was a retired employee of the Kelly-Springfield Tire Company and operated a real estate business at Short Gap. Born at Patterson Creek, W.Va., he was a son of the late William H. and Emma E. (Long) Grace. He was a member of Wesley Chapel Methodist Church and Cumberland Lodge 271, LOOMoose. 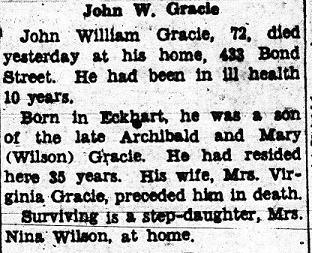 Surviving are his widow, Sarah C. (Kidwell) Grace; a sister, Miss Olive Grace, Short Gap; three brothers, Earl Grace, Short Gap; Homer Grace, Williamstown, W. Va., and John Grace, Clinton, Mich.; a step-daughter, Mrs. Charles E. Blackburn, Ridgeley, and two step-grandchildren. The body is at the George Funeral Home. Mrs. Iona Mae Grace, 37, wife of J. Earl Grace, Short Gap, died Saturday at her home. She had been in ill health several years. A native of Vandergrift, Pa., she was born August 23, 1921, a daughter of Grover C. Clark and the late Mary (Leonard) Clark. She was a member of the Wesley Chapel Methodist Church of Short Gap. Besides her husband and father, she is survived by a daughter, Earlene V. Grace, at home; a son, Dewayne G. Grace, at home; her stepmother, Mrs. Marie (Long) Clark, of Vandergrift; a stepbrother, Charles Cypher of Cleveland; and four sisters, Mrs. Irene Heckman, Mrs. Dorothy Jones, Mrs. Evelyn Williams, all of Vandergrift, and Mrs. Ruth Long, Patterson Creek. The body is at the George Funeral Home, where friends will be received. The body will be taken to Wesley Chapel Methodist Church for services on Tuesday at 2 p.m. Rev. Alonzo Harmon and Rev. John Teter will officiate. Interment will be in Fort Ashby Cemetery. Pallbearers will be Robert Long, Franklin Ward, Wayne Feaster, Clarence Betson, Baker Brelsford, and Virgil Dyer. J. Earl Grace, 55, Short Gap, died Friday in Memorial Hospital where he had been admitted earlier in the day. He had been in ill health one year. He was a son of the late William H. and Emma E. (Long) Grace, and was born in Short Gap. His wife, Iona Mae Clark, died in 1959. Mr. Grace was a member of the Wesley Chapel Methodist Church of Short Gap and was employed as an iron worker. He was a member of Local 586, International Association of Bridge and Iron Workers. Survivors include a daughter, Earlene V. Grace, at home; a son, Dewayne G. Grace, at home; two brothers, Homer Grace, Williamstown, W.Va., and John, Clinton, Mich., and a sister, Miss Olive Grace, Short Gap. The body is at the George Funeral Home. Services will be conducted today at 2 p.m. in the Wesley Chapel Methodist Church, Short Gap. Rev. Richard L. Longbon will officiate, and burial will be in Fort Ashby Cemetery. Pallbearers will be Floyd Umstot, Baker Brelsford, Franklin Ward, Wayne Feaster, Robert Long, and Virgil Dyer. Miss Olive "Dot" Virginia Grace, 79, formerly of Fort Ashby, W.Va., died Tuesday at the Cortland Acres Nursing Home in Thomas, W.Va. Born in Dan’s Run, W.Va., she was a daughter of the late William H. Grace and Emma (Long) Grace. She was a member of Wesley Chapel United Methodist Church. Survivors include one brother, John H. Grace, Clinton, Mich., and a niece, Earlene Hott, Ridgeley, with whom she had resided. George-Upchurch Funeral Home is in charge of arrangements. Lieut. Raymond W. Grace was reported missing in action July 8, 1943 when his plane was shot down over the Mediterranean. All of the crew except the navigator were lost at sea. His death on July 9, 1943 was confirmed to his wife Dorothy by the War Department. One of the first men of this area to take the Elks refresher course, Lieut. Grace entered the army April 7, 1942, as an aviation cadet and was commissioned as a bombardier 2nd Lieutenant in Albuquerque, N. M., in September 1942. A graduate of Allegany high school, class of 1934, he saw combat duty in North Africa and took part in raids over Germany, Sicily, and Italy, and was in the Battle of North Africa. He was posthumously awarded the Purple Heart, the Air Medal, and two Oak Leaf Clusters at a memorial service at the Trinity Methodist Church in Fort Ashby, May 7, 1944. He was the son of William Grace and was 27 years old. KEYSER, W.Va., Jan. 4 - Robert Carl Grace, 76-year-old retired farmer, died this afternoon at his home, Keyser RFD 2, Short Gap, W.Va. He was the son of the late John and Catherine Daniels Grace. His wife, Mrs. Rozetta Grace, died in 1940. Mr. Grace is survived by one daughter, Mrs. Julia Rowan, Pasadena, Calif.; and four foster children, Mrs. Marie Skiver, Columbus, Ohio; Corp. James M. Shipe, Camp White, Ore.; Leslie League, Keyser; and Mrs. Merla Gray, at home. Three brothers, William Grace, Short Gap, Virgil Grace, Portland, Ore., and Walter Grace, Springfield, W.Va., also survive. The body remains at the Wolford funeral home in Cumberland. Mrs. Rozetta Catherine Grace, 68, wife of Robert C. Grace, Short Gap, W.Va., who died yesterday at Allegany Hospital, was a daughter of the late Jonathan and Julia (Rice) Baker. Surviving, besides her husband, are a daughter, Mrs. Julia Rowan, Pasadena, Calif., and two brothers, William and Howard Baker, Pattersons Creek, W.Va. The body will remain at Wolford's funeral home until noon Sunday, when it will be removed to the home at Short Gap. Mrs. Sarah C. Grace, 72, of Short Gap, died yesterday in Memorial Hospital, where she was admitted last Thursday. Born at North River Mills, W.Va., she was a daughter of the late Robert S. and Sarah E. (Largent) Kidwell. Twice married, she was also preceded in death by her first husband, Clyde B. Rogers, who died in 1954, and her second husband, Floyd P. Grace, who died in 1964. Surviving are a daughter, Mrs. Charles E. Blackburn, Ridgeley; two sisters, Miss Nellie P. Kidwell, Romney, and Mrs. Virginia Robins, Baltimore; a brother, Marvin Kidwell, Shanks, W.Va.; and two grandchildren. The body is at the George Funeral Home. William Homer Grace, 79, died this morning at his home in Short Gap, W.Va. A retired farmer, he had been in failing health for the past two years. His wife, Emma L. Grace, died nine years ago. Son of the late John and Kathryn Daniels Grace, he is survived by four sons, J. Earl, at home; Dwight P. and John H., Short Gap, and Charles H., Charleston; a daughter, Olive V., at home; a brother, Virgil, Portland, Ore., and three grandchildren. A member of Short Gap Methodist Church, he was a lifelong resident of the Short Gap area. The body will remain at the home. Frostburg, Feb. 8.- Archibald Gracy[sic], 80, a former resident of Eckhart, died yesterday at the home of his son, Thomas A. Gracy, 630 Allendale street, Baltimore. His body will be brought here today and taken to the Frostburg Furniture company mortuary, where services will be conducted Sunday. Interment will be in the Eckhart cemetery. Mr. Gracie leaves two sons, Thomas, Baltimore and John, Cumberland. Dr. W. A. Gracie, Cumberland; Thomas Gracie, Eckhart, and Robert Lee, this place are nephews. The funeral of Mrs. Archie Gracie, who [d]ied in Philadelphia, Pa., several days ago, and whose remains were brought here for interment, took place yesterday. Interment was made in Eckhart cemetery, Rev. J. N. Edwards, of the Eckhart M. E. church, officiated at the services. Bureau of the Evening Times, Eckhart, Dec 13. Mrs. John Gracie, of Eckhart, died at the Western Maryland Hospital in Cumberland Monday noon, not long after reaching the hospital. Mrs. Gracie and her three sons, were ill with typhoid fever, and were taken to the hospital for treatment, and care. Mrs. Gracie's death was sudden and unexpected. She was of about middle age and the mother of a large family. She was a most exemplary wife and a woman of many good qualities. She has lived all her life at Eckhart, being well and favorably known. She was the daughter of the late Mr. and Mrs. John Pingally[sic] of Eckhart. One sister, Mrs. Thomas Eckhart, and a husband and the following children survive: Messrs. John, Harry, Robert and James Gracie and Masters Lewis and Earl Gracie. Mrs. Gracie's death is supposed to be due to the fever and owing to overwork and worry. She had just nursed a grown son through a severe attack of fever, when her three sons and then herself succumbed to the disease. Much sympathy is being shown for the family. Frostburg - Mrs. Frances L. Gracie, 69, Clarysville, died this morning in Sacred Heart Hospital, Cumberland, where she had been a patient seven months. She was a daughter of the late John and Mary Dockman and the widow of John P. Gracie. She is survived by three daughters, Mrs. Frances Klosterman and Miss Bernadette Gracie, both of Mt. Savage, and Mrs. James Booth, Eckhart; four sons, Earl Gracie, Tyler, Texas; James Gracie, Troupe, Texas; Edward Gracie, Mt. Savage; and Thomas Gracie, Clarysville, ten grandchildren and a great-grandchild. She was a member of St. Michael's Catholic Church. The body will be at the Durst Funeral Home after 7 p.m. today. Friends will be received from 7 to 9 p.m. today, and from 2 to 4 and 7 to 9 p.m. tomorrow. Frostburg - John P. Gracie, 71, died yesterday at the home of his daughter Mrs. James Booth, Eckhart, after being in failing health for some tiem. He was a retired Kelly-Springfield Tire Company worker. Besides his daughter he is survived by two other daughters, Mrs. Frances Klasterman and Miss Bernadette Gracie, Mt. Savage; four sons, Earl Gracie, Tyler, Texas; James Gracie, Troupe, Texas; Edward Gracie, Mt. Savage and Thomas Gracie, Clarysville; three brothers, Robert Gracie, Frostburg; Harry Gracie, Detroit and Lewis Gracie, Midway, Pa; ten grandchildren and a great-grandchild. He was a member of Eckhart Baptist Church. The body will be at the Durst Funeral Home where the family will receive friends from 2 to 4 and 7 to 9 p.m. Services will be held at the funeral home Tuesday with Rev. Brooks Henry, pastor of Eckhart Baptist Church officiating. Interment will be in Eckhart Cemetery. John William Gracie, 72, died yesterday at his home, 433 Bond Street. He had been in ill health 10 years. Born in Eckhart, he was a son of the late Archibald and Mary (Wilson) Gracie. He had resided here 35 years. His wife, Mrs. Virginia Gracie, preceded him in death. Surviving is a step-daughter, Mrs. Nina Wilson, at home. Frostburg - Robert R. Gracie, 75, Consolidation Village, died yesterday afternoon in Miners Hospital, where he was admitted December 6. 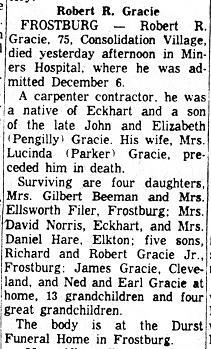 A carpenter contractor, he was a native of Eckhart and a son of the late John and Elizabeth (Pengilly)[sic] Gracie. His wife, Mrs. Lucinda (Parker) Gracie, preceded him in death. Surviving are four daughters, A Mrs. Gilbert Beeman and Mrs. Ellsworth Filer, Frostburg; Mrs. David Norris, Eckhart, and Mrs. Daniel Hare, Elkton; five sons, Richard and Robert Gracie, Jr., Frostburg; James Gracie, Cleveland and Ned and Earl Gracie at home, 13 grandchildren and four great-grandchildren. The body is at the Durst Funeral Home in Frostburg. A Brother of Archie Gracie Meets Death in a Coal Mine. 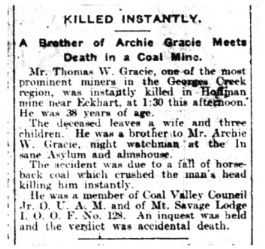 Mr. Thomas W. Gracie, one of the most prominent miners in the Georges Creek region, was instantly killed in Hoffman mine near Eckhart, at 1:30 this afternoon. He was 38 years of age. The deceased leaves a wife and three children. He was a brother to Mr. Archie W. Gracie, night watchman at the Insane Asylum and almshouse. The accident was due to a fall of horseback coal which crushed the man's head killing him instantly. He was a member of Coal Valley Council Jr. O.U.A.M. and of Mt. Savage Lodge I.O.O.F. No. 128. An inquest was held and the verdict was accidental death. 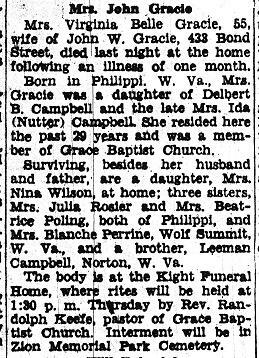 Mrs Virginia Belle Gracie, 55, wife of John W. Gracie, 438 Bond Street, died last night at the home following an illness of one month.Born in Philippi, W. Va., Mrs. Gracie was a daughter of Delbert B. Campbell and the late Mrs. Ida (Nutter) Campbell. She resided here the past 29 years and was a member of Grace Baptist Church.Surviving, besides her husband and father, are a daughter, Mrs. Nina Wilson, at home; three sisters, Mrs. Julia Rosier and Mrs. Beatrice Poling, both of Philippi, and Mrs. Blanche Perrine, Wolf Summit, W. Va., and a brother, Leeman Campbell, Norton, W. Va.The body is at the Kight Funeral Home, where rites will be held at 1:30 p.m Thursday by Rev. Randolph Keefe, pastor of Grace Baptist Church. Interment will be in Zion Memorial Park Cemetery. Doctor Dies - Dr. William A. Gracie, 67, prominent Cumberland physician and surgeon, died about noon today in Sinai Hospital, Baltimore, where he had been a patient for about three weeks. He rose to a prominent place in Maryland medical circles following five years as a coal miner in the Georges Creek section while a young man. Dr. William A. Gracie, 67, well known local physician and surgeon died shortly after noon today in Sinai Hospital in Baltimore where he had been a patient for about three weeks. With him when he died were his wife Mrs. Anna Lee (White) Gracie, a daughter, Mrs. Elizabeth Wilson, wife of William L. Wilson, Jr.; and a son, William A. Gracie, Jr. Dr. Gracie was born at Eckhart on October 4, 1884, the son of James and Mary (Elizabeth) Gracie. He had one sister, Eleanor, who died in the flu epidemic in Novermber, 1918. She was instructor in German and mathematics in the Allegany County Academy. Until he was 13 years old, Dr. Gracie attended public school at Eckhart. During the next five years he worked in the coal mines. When 18 years of age he left the mines and became a clerk in the general merchandise store operated by his uncle at Eckhart. It was at this time that he decided to prepare himself for a medical career. He spent one year at Williamsport Seminary and another at Frostburg Normal School. In 1906 he entered the medical school at the University of Maryland in Baltimore and was graduated in 1910. For the next two and a half years he was an interne in University Hospital, Baltimore. Dr. Gracie came to Cumberland in 1912 to establish a practice. He served as health officer for Allegany county in 1914 and 1915. On November 30, 1915, he was married to Miss Anna Lee White, daughter of the late Mr. and Mrs. Warren G. White of this city. Dr. Gracie was a member of the American Medical Association, the Maryland Chi(? )surgical Faculty, and the Allegany-Garrett County Medical Society. He belonged to Emmanuel Episcopal Church and Fort Cumberland Lodge No. 211 A.F.(?) and A.M.
Craig Alan Grady, 42, of Short Gap, passed away Friday, Nov. 1, 2002, from (ALS) Lou Gehrig’s Disease, after a long illness, at Memorial Hospital, Cumberland, Md. Born Oct. 9, 1960, in Cumberland, he was the son of Mary E. (Twigg) Grady, Short Gap, and the late Jack Lee Grady. Mr. Grady was an electrician, employed by Elite Electrical Services, and supervisor of Telecommunications projects in New York City. He was a member of Local 307 I.B.E.W., Wesley Chapel United Methodist Church, and the National Rifle Association. He loved hunting and fishing. His family owned Grady’s Live Bait Shop in Fort Ashby. Craig restored a 1970 Mustang, won the All Ford National Award in Carlisle, Pa., and received the award from Chip Miller and Ned Jarrett. He was an avid Steeler fan and met Jerome Bettis, the star running back for the Steelers. Surviving are his wife, Sharon Lynn Grady; two daughters, Jackie Sue Grady and Jessica "Jessie" Nicole Grady; two sisters, Linda J. Draper and husband Hank, Dover, Del., and Cheryl K. Fleming and husband Wayne, South Fulton, Tenn.; two brothers, Michael L. Grady and wife Kellie, Short Gap, and Dale Grady and wife Connie, Fort Ashby; a very devoted sister-in-law, that helped throughout his illness, Tammy Broll, Cumberland; 18 nieces and nephews; and two great-nieces. Friends will be received at the Scarpelli Funeral Home,PA., 108 Virginia Ave., Cumberland, on Sunday from 2 to 5 p.m. and one hour prior to the service. Funeral services will be conducted at the funeral home on Monday at 1 p.m. with Rev. Paul Mateer officiating. Interment will be in Fort Ashby Cemetery. The family requests that contributions be made to Jackie and Jessie Grady’s Educational Trust Fund, 65 Shady Hill Court, Ridgeley, WV 26753. Pallbearers will be Brett Robertson, David Ault, William Ault, Colin Englebach, Greg McDolin Englebach, Greg McDonald, and Timmy Moreland. Honorary pallbearers will be Ronney Weimer, Jeremy Broll, Chris Davis, Michael Adams, Shane Grady, Brandon Grady, and Jared Grady. Mrs Ella Grady, 57, widow of Michael Grady, died at 12:30 o'clock this morning at her home, 242 Center Ave, following an illness of six weeks. She is survived by two children, Getson Grady and Miss Regina Grady at home. The deceased was a sister of Peter Wright, Cumberland and Mrs Anthony Miller of Philadelphia. Mrs Grady was a member of St Patrick's church from which the funeral will take place at time to be announced later. FORT ASHBY, W.Va. - Jack Lee Grady, 54, of here, died Tuesday at Memorial Hospital. Born in Cumberland April 11, 1930, he was the adopted son of Lester Valentine and Ida (Grady) Valentine, who reside at RD 4, Oldtown Road. His mother is Mrs. Stella Decker, Glen Oaks, city. Mr. Grady grew up in Cumberland and was a 1948 graduate of Fort Hill High School. He was a retired yardmaster for the Chessie System and was a member of Wesley Chapel United Methodist Church, Short Gap, W.Va., and the Brotherhood of Railway Yardmasters. Also surviving, besides his adoptive parents and his mother, are his widow, Mrs. Mary E. (Twigg) Grady; three sons, Michael Lee Grady and Craig A. Grady, both of Fort Ashby; L.Dale Grady, Port Sulphur, La. ; two daughters, Mrs. Linda J. Wharton, Hartly, Del. ; Mrs. Cheryl K. Fleming, Ridgeley, W.Va.; one brother, Floyd Grady, RD 4, city; one sister, Mrs. Irma Largent, Slanesville, W.Va., and six grandchildren. Friends will be received at the Scarpelli Funeral Home on Thursday. Services will be conducted Friday at 3 p.m. at Wesley Chapel United Methodist Church, Short Gap, by the Rev. Steven Brent Rhoades. Interment will be in Fort Ashby Cemetery. Mrs Amanda Ann Graham. 87, of ?01/2 Market Street, died this morning at her home after being seriously ill two weeks. She was a member of Centre Street, Methodist Church and Manhattan Temple No. 8, Pythian Sisters. Her husband, William A. Graham, died February 24, 1943. She ls survived by a daughter, Miss Edith B Graham, at home and a number of nieces and nephews. The body will remain at the Hafer Funeral Home for services Saturday at 11 a.m. to be conducted by Rev Norman O Scribner, pastor of Centre Street Methodist Church. Interment will be in Hillcrest Memorial Park. Frostburg - George R. Graham, 87, Mt. Savage, died yesterday in Avalon Manor, Hagerstown. Born in Mt. Savage April 25, 1892, he was the son of the late James and Elizabeth (Morgan) Graham. He was a retired employee of The Kelly-Springfield Tire Company, a member of Kemp Lodge 154 AF & AM, Ali Ghan Shrine Temple and St. George's Episcopal Church, Mt. Savage. Surviving are two sisters, Miss Mary B. Graham, Mt. Savage, and Mrs. Virgil F. Bowyer, Pittsburgh, Pa. Friends will be receive from 2 to 4 and 7 to 9 p.m. today at the Durst Funeral Home. Services will be conducted at 2 p.m. tomorrow in St. George's Episcopal Church, Mt. Savage. Interment will be in the church cemetery. Kemp Lodge will conduct a memorial service today at 7:30 p.m. at the funeral home. The funeral of Mrs. Thomas Graham took place yesterday afternoon from her home. The interment was in the family burying ground. Rev. Father DeWulf officiated. A large number of Frostburg and Cumberland friends were in attendance. MT. SAVAGE - James B. Graham, 71, a former resident, died yesterday at Perry Point VA Hospital. Born in Mt. Savage, he was a son of the late Robert and Agnes (Rankin) Graham. He was a World War I veteran. He is survived by his wife, Jenny (Russell) Graham, Baltimore; a son, Robert Graham, Sheldon, Iowa; three brothers, Colon Graham, Barrelville; John Graham, Barberton, Ohio; Lynn Graham, Mt. Savage; two sisters, Mrs. Mary Koontz and Mrs. Agnes Crump, here; and one grandchild. The body is at the Durst Funeral Home, Frostburg, where friends will be received today from 7 until 9 p.m. and tomorrow from 2 until 4 p.m. and 7 until 9 p.m.
GRAHAM, - On August 25, 1899, at his late residence, No. 8 West Madison street, JOHN VANLEER GRAHAM. The body of Mr. John V. L. Graham, who died Friday last at his home, 8 West Madison street, was sent to Cumberland n the 9:40 train yesterday morning from Camden Station for burial. Accompanying the body were the pallbearers who served in Baltimore: Dr. M. B. Billingslen, H. L. Hilligust, C. P, Dahle, O. H. Cummings, G. C. Diggs, E. I . Hyde, Theophilus Hill and Dixon Guy. Services were held in the First Presbyterian Church, Cumberland, by Rev. Dr. James Moffatt, who pronounced a brief eulogy. the grave was lined with ferns and the bank of earth was covered with a floral mat. The pallbearers at Cumberland were Chief Judge A. Hunter Boyd, Congressman George A. Pearre, Samuel Smith, Roderick Clary, Mervin McKaig, and Robert H. Gordon. A number of friends from Baltimore attended the funeral. Funeral services over the remains of John Van Lear Graham, who died last Friday at his late home, 8 West Madison street Baltimore, were held Monday afternoon at three different places throughout the city. Services were first held at his late home, at which Rev. Dr. Smith, pastor emeritus of Central Presbyterian church and Rev. J. P. Campbell, pastor of Faith Presbyterian church officiated. Thence the remains were converyed to First Presbyterian church, where the same clergymen officiated. The body was then taken to Faith Presbyterian church, where Drs. Smith and Campbell conducted services. The body rested during the night in the church, where a guard of honor from the Young Men's Bible Class kept watch. On Tuesday the remains were brought here on train No. 5 and taken to the Presbyterian church, where funeral services for the fourth time were held, Rev. Dr. Moffatt officiating. The bearers were Judge A. H. Boyd, Col. G. A. Pearre, Dr. Samuel Smith, R. Clary, Merwin McKaig, and Capt. R. H., Gordon. Interment was made in Rose Hill Cemetery. Mrs. Rose A. Graham, 55, of 22 Perry Street, Ridgeley, died yesterday at Sacred Heart Hospital, where she had been admitted November 30. She had been in failing health eight months. Born in Parsons, W. Va., she was a daughter of Daniel B. and Lillie (Hawkins) Eckard. She was a member of Calvary United Methodist Church, Ridgeley. Surviving are her husband, Ira W. Graham, and one daughter, Miss Dila Beth Graham, at home; three sisters, Mrs. Bessie Wiegand, LaVale; Mrs. Pearl Dawson, Cumberland, and Mrs. Alice M. Wentz, Philippi, W. Va., and two brothers, Albert Eckard, Centerville, Pa., snd Oliver Eckard, Conway, S. C. The body is at the George Funeral Home. GRAHAM 04 Feb 1890 Dr Thomas J Graham, a nephew of Thomas Johnson who is the father of the Johnson Brothers Lumber of Frostburg, shot himself at his home 3 miles west of Frostburg yesterday. He was originally from Frederick City MD, but had lived here for the past 40 years. He was married twice, his last wife, Miss Duke from Frederick City, died from paralysis about 6 months ago. He leaves 7 children- 5 boys and 2 girls. He was 59 years, 6 months, and 29 days of age. The funeral is tomorrow with interment in the Johnson Grave yard, 4 miles west of Frostburg. Grafton, W. Va., June 27 - William Graham, one of the first white children born in Preston county, and a resident of Grafton for 60 years, died at the age of 80. His father was among the state's first settlers. He served throughout the Civil War and was a charter member of the local lodge of the Odd Fellows. He served as a B&O employee for over 50 years, retiring in 1900. He was the family of railroad men, as all four sons were in the railway service. He is survived by his wife, two aged sisters and one brother, six children and 19 grandchildren. Mrs. Alice G. Grahame, 87, died today in her home on Cash Valley Road. Born in Mt. Savage, she was a daughter of the late Henry and Rachel (Barnes) Herget and a member of St. Patrick's Catholic Church. Her husband, R. Johnson Grahame preceded her in death. She is survived by six sons: William C Grahame, at home; Henry T Grahame, Newport, Ohio; Raymond B Grahame, Roanoke, Va; James P Grahame, city and Eugene F Grahame, at home: five daughters; Mrs Rose E Sunder, Witchita, Texas; Mrs Alice G Paul, Bowman's Addition; Mrs Angela Grimes and Mrs M Madeline Rice, both of Cumberland and Miss Clara Grahame, at home: 40 grandchildren and forty-three great grandchildren and three great-great-grandchildren. The body is at the Stein Funeral Home where friends will be received from 7 to 9 p.m. today and 2 to 4 and 7 to 9 p.m. tomorrow. Requiem mass will be celebrated at 9 a.m. Friday at St Patrick's church with interment in St Patrick's cemetery. The rosary will be recited at 8 p.m. tomorrow at the funeral home. Miss R. Elizabeth Grahame died this morning at the home of the niece, Mrs. Faye Keiser, Route 1 Crystal Park. Born in Frostburg, Miss Graham was a member of Ss. Peter and Paul Catholic Church and the Daughter of the American Revolution. Her parents were the late Thomas and Anna (Duke) Grahame. Survivors include a brother Thomas Grahame, and one sister Mrs. Carrie Hughes, both of Pittsburgh. The body is at the George Funeral Home. MEYERSDALE, Pa. - J. Frederick Grahame, 74, of here, died yesterday in Meyersdale Community Hospital. Born in Frostburg, Md., he was a son of the late Richard and Mitie (Beal) Grahame. He is survived by his widow, Clara (Bittner) Grahame, and a brother, Bradley Grahame, Meyersdale. The body is at the Price Funeral Home, where services will be conducted tomorrow at 2 p.m. by Rev. Dr. E. Wilson Kelley. Burial will be in White Oak Cemetery. Mt Savage, Sept 8 - Services for John Colin Grahame, 72, husband of Mrs Margaret (Malloy) Grahame, who died Tuesday were held yesterday at St Patrick's Catholic Church with a requiem high mass. The Rev Michael S Smythe, pastor officiated. Interment was in the catholic cemetery. The pallbearers were: Charles Blucker, Ellsworth Crump, Timothy Tansey, Edgar Bever, Charles Cunningham and Walter Blank. Attending were: George Grahame, Harriman, Tenn; Mr and Mrs Fay Keiser and children, Crystal Park; Mrs Walter Huston, Mrs Charles Hughes, Miss Elizabeth Grahame, Mrs Mary Boyle, Mrs Rose Saunder and Thomas Grahame, Pittsburgh. Miss Alice Grahame, Mrs and Mrs Joseph Grahame and Cecil Grahame, Cash Valley; George Miller, Highland Falls, N.Y.; Mr and Mrs James Miller and Mrs George W Davis, Frostburg; Mrs Angela, LaValle; Mr and Mrs Henry Grahame, Mrs Anna Miller, Mrs Henry Mullaney and Mr and Mrs Edward Malloy, Cumberland. Mount Savage, June 3 - Mrs Margaret Cecelia Grahame, 71, widow of Colin Grahame, died suddenly Sunday afternoon at her home on Calla Hill. Mrs Grahame was a native and life resident of Mt Savage and a daughter of George and Mary Malloy. She was a member of St Patrick's Catholic Church, the Sodality of the Blessed Virgin Mary and the ladies auxillary of the Ancient Order of Hiberians. Her husband died suddenly last September. Surviving are three sons, Walter Grahame of Philadelphia; Rockwell Grahame of Midland and George Grahame of Mt Savage; five daughters, Mrs Fay Keiser of Crystal Park and Mrs Stephen F Boyle, Mrs Colin Barth, Misses Margaret and Catherine Grahame, at home; a brother, George Malloy and three sisters; Mrs Catherine McDarmitt, Mrs Michael Fannon and Miss Gertrude Malloy; seventeen grandchildren and a number of nieces and nephews also survive. Frederick S. Graichen, for the past 14 years Secretary and Treasurer of the woolen and Cassimer Mills at Martinsburg, W. Va., died Thursday, November 28, aged fifty-one years. He is survived by a widow and four young children. Mr. Graichen was the owner of the Palace Bowling Alleys and the Majestic Theatre at Martinsburg. He was also Mason of high rank, being a member of the Templar and Royal Arch degrees in Martinsburg and the Blue Lodge in Providence, Rhode Island. He was also a member of the Knights of Pythias and Odd Fellows. He was a native of Providence, to which place his body will be taken for interment today. Requiem mass for Mrs. Anna LaVern Graim, 71, of 517 North Centre Street, who was killed Sunday in a two-car accident on Route 40 at Eckhart, will be celebrated Thursday at 10 a.m. at St. Patrick's Catholic Church. Interment will be in St. Michael's Cemetery, Frostburg. A. native of Frostburg, Mrs. Graim was a daughter of the late Michael and Laura (Lyons) Rafferty. She was a member of St. Patrick's Church and the sodality. Surviving are her husband, Charles E. Graim; two sisters, Mrs. Robert Carter, Mt. Savage, and Frances Brannon, Adelphi; a half-sister, Mrs. Catherine McDonald and three grandchildren. The body is at the Stein Funeral Home where friends will be received from 2 until 4 and 7 until 9 p.m. The rosary will be recited there tomorrow at 7 p.m.
Lonaconing - Raymond Grandstaff, 73, of here, died Monday in Sacred Heart Hospital, Cumberland. Born in Westernport on April 6, 1913, he was the son of the late Clarence and Katherine (Clise) Grandstaff. Retired with 30 years service as a lab technician for the Celanese Corporation, Mr. Grandstaff is a member of First United Methodist Church, Lonaconing Lions Club, Lonaconing Republican Club and Lonaconing Senior Citizens. Surviving are his widow, Mildred (Crowe) Grandstaff; two sons, Richard W. Grandstaff, Lonaconing, and Kenneth L. Grandstaff, Thurmont; one daughter, Mrs. Nancy Livingston, Frostburg; three brothers, Francis "Bud" Grandstaff, Westernport; Leroy Grandstaff, Honeybrook, Pa., and Norris Grandstaff, Williamsport; one sister, Mrs. Ruth Orndorff, Keyser, W. Va., and five grandchildren. Interment will be in Frostburg Memorial Park Tuesday at 2 p.m. A memorial service will be conducted at First United Methodist Church at 2 p.m. by the Rev. Carl Synan and the Rev. Kenneth Hamrick. The family requests that memorials take the form of donations to the George's Creek Ambulance Service or First United Methodist Church. The Boal Funeral Home, Lonaconing is in charge of arrangements. "Sister Bertha Graney entered St. Mary's Academy Community in Leavenworth, Kansas in 1867. Two years after entering the Community, Sister Bertha went to Helena, Montana, where she remained until 1896, returning to Kansas then. Sister Bertha's relatives live in Piedmont, West Virginia." NOTE: this is the daughter of William Francis Graney and Ellen Welsh. "Funeral services for Sister Bertha Graney, one of the pioneer Sisters of St. Mary's Academy, were said at 9:30 o'clock yesterday morning at the Academy. Interment was in the afternoon. Sister Bertha, who was 76 years old, died early Friday morning at St. John's Hospital after a four months illness." "Piedmont-It is our sad duty to announce the death of Mrs. Ellen Graney, a well known lady which occurred Thursday morning. Mrs. Graney was 87 years old and had been in poor health for some time. Her funeral will take place from St. Peter's Catholic Church at 10 O'clock Saturday morning, of which denomination Mrs. Graney had been a devout member for many years." "Lonaconing-The funeral of Mrs. Ellen Graney took place on Sat. Feb 2. The body was taken to St. Peter's Catholic Church, thence to the old cemetery and there in the shadow of the church it was laid to rest beside her husband. Mrs. Graney was a native of County Galway, Ireland. She was beloved by all who knew her and leaves one son and five daughters." "Frank P. Graney, 58, a Baltimore & Ohio Railroad conductor between Cumberland and Grafton, died at 6:20 a.m. today at his home 416 Maryland avenue, following a heart attack. He had been ill for two weeks having been stricken while on duty and brought back home before completing this run. He had not been in good health since he had been in an accident in 1933. A native of Barton, this county, he was in the railroad service thirty-five years, and from 1918 to 1932 served as assistant trainmaster for the B & O at Morgantown and Kingwood Junction. He had held life membership in the Grafton Lodge, B.P.O. Elks, and Piedmont Council, Knights of Columbus. He was also a member of the Brotherhood of Railway Trainmen. Surviving are his widow, Mrs. Nellie J. Graney, two daughters, Miss Jean Graney, a nurse, State Department of Health, Cambridge, Md., and Mrs. Edward V. Welsh, 801 Bedford street, this city, and one son, John F. Graney, at home. He was a brother of William Graney, New York; John Graney, Westernport; Mrs. Katherine Thompson, Akron, Ohio, and Mrs. Richard Stakem, Lonaconing. Funeral services will be conducted Saturday at 9 a.m. in St. Patrick's Catholic Church. Interment will be in SS. Peter and Paul Cemetery." "Funeral services for Joseph A. Graney, 60, who died Wednesday night at his home on West Hampshire street, were held Saturday morning at St. Peter's Catholic church, with high requiem mass conducted by Rev. Joseph Lansinger, assistant pastor. Rev. Michael Kenneth Carney, pastor of St. John's church, Baltimore; Rev. A. Scarpati and Rev. victor Dowgiallo, pastor and assistant pastor of St. Peter's, were in the sanctuary. Mrs. Edward H. Pendergast sang "Rest for the Weary" and "Thy Will Be one." Emmett Haran sang "Mother at Thy Feet I'm Kneeling." Interment was in the Catholic cemetery at Terra Alta. The pallbearers were John Dugan, Bryan Healy, DeSales Bissett, Edward Mullan, Ligouri Bissett and James Walsh. Among those from out of town were...Mr. Graney, a native of Piedmont, was a son of the late Frank and Rebecca Graney. He learned the machinists' trade at the Baltimore and Ohio railroad shops here and was a night foreman before he was transferred to Keyser in 1920 when the local shops were closed. Two years ago he underwent a major operation and since that time had been in ill health. For the past four months he had been bedfast. He was a member of Piedmont Council, Knights of Columbus, and of the Holy Name Society. Besides his wife, Mrs. Anne (Welch) Graney, he leaves two sisters, Mrs. Mary Veach and Miss Elizabeth Graney, and a brother, Michael Graney, all of Piedmont." Milford, PA - Mrs. Loretta (Moran) Graney, 83, formerly of Cumberland, MD., died Saturday at Mercy Community Hospital in Port Janis, N.Y. She was the daughter of the late Michael P. Moran and Anna (Wempe) Moran. Mrs. Graney was a member of St. Patrick's Catholic Church here. She is survived by her husband, John Graney; three sons, Michael Graney, Chevy Chase, Md. ; James Graney, Bellerose, N.Y.; Dennis Graney, Sparta, N.J.; five daughters, Mrs. Catherine Wilson, El Cajon, Calif.; Mrs. Mary Mott, Arlington, Va.; Mrs Anne Pizzicara, Brooklyn; Mrs. Patricia Dunkel, State College; Mrs. Bernadette Schmalv, of here; one sister, Mrs. Alberta King, Cumberland, Md. ; 29 grandchildren and 10 great-grandchildrn. Friends were received at the Stroyan and Crellin Funeral Home here. Services were held at St. Patrick's by Father William Hines. Interment was in Milford Community Cemetery. "Mrs. Stella Naughton Graney, wife of Michael Ganey, 30 C Street, Keyser, died yesterday morning at the Hoffman Hospital, Keyser. She had been ill for some weeks. She was a patient in Allegany Hospital, Cumberland, after which she was brought to her home at Keyser, and recently removed to the Hoffman Hospital. Mrs. Graney was a professional nurse, being a graduate of the nurses' training school of Providence Hospital, Washington, D.C. The body was taken to the home of her mother, Mrs. Mary Naughton, Westernport. Funeral services will probably be held from St. Peter's Catholic Church, Westernport, Monday morning. Besides her mother, she is survived by her husband, Michael Graney; three sisters, Mrs. Rosalie Kerns, WheelingW. Va.; Mrs. Helen Whitworth, Asheville, N.C. and Miss Mary Naughton, Morgantown, W. Va., and two brothers, John Naughton, Westernport, and Owen Naughton, California." Mrs Elizabeth Grannan died at her late residence at Bloomington, Garrett Co at 5:30 o'clock last evening, her death being due to old age. Mrs Grannan was born in Baltimore, January 13, 1821 and resided there until 1859 when she was married to Patrick Grannan, a machinist employed by the Baltimore & Ohio railroad who died twenty years ago. After their marriage Mr and Mrs Grannan removed to Cumberland where the deceased resided until ten years ago when she went to Bloomington to reside with her daughter. She is survived by the following children: Mrs Andrew Mullen of Bloomington; Mrs Katherine Phillips of Piedmont; Mrs O'Neil of Cumberland and the Honorable Eugene Grannan of Baltimore formerly Chief of the Baltimore & Ohio detective force and now police magistrate Baltimore. Mrs Columbus Meade of this city(sic) & Mrs Columbus Meade of Baltimore(sic). The remains will be brought here tomorrow morning and taken to the residence of Mrs Yarnall on Park street and the funeral will take place Wednesday morning from St Patrick's church. Baltimore, September 2 - Eugene E Grannan, for many years active in Democratic politics and a former police magistrate, died at his home here. He had been in ill health for a year. Mr Grannan was 74 years old, having been born in Cumberland in 1852. He had thousands of friends in Baltimore and throughout the state to whom he was familiarly known as 'Gene' and 'Judge'. In addition to his two terms as police magistrate in the Central and Western Districts, Mr Grannan was president of the Board of Liquor License Commissioners under Governor John Walter Smith and president of the Commission for opening streets under Mayor James H Preston. He held his last political office in 1922 when he was elected to the House of Delegates where he was one of the oldest members. He had emerged from comparative political retirement to make the campaign. Prior to engaging in politics, Mr Grannan was a detective for the Baltimore & Ohio railroad for 20 years and for seven years was a newspaperman. He was educated in Cumberland. Mr Grannan is survived by two sons: Eugene, Jr and John C Grannan of Asheville, N.C.; by three daughters; Miss Katherine M Grannan, Mrs Lucia G Murphy and Mrs Helen G Murphy and by two sisters, Mrs Frances Mullen and Mrs Katherine Phillips, both of California. ---- Two sisters are deceased: Mrs Dennis O'Neill and Mrs Peter Yarnall, both of this city. Thomas Grannan, brother of Chief Eugene Grannan of the Baltimore & Ohio secret service and Mrs Pete Yarnell of this city, died Wednesday in Baltimore in the 46th year of his age. He was a native of Cumberland and had many friends here. MIDLAND — Mrs. Alice (Monahan) Grant, a former resident of Midland, died yesterday at the home of a niece, Mrs. Charles Lynn, Aliquippa, Pa., with whom she resided. She was the widow of the late Patrick A. Grant. Survivors include a niece, Mrs. Annadell Malloy, Mt. Savage. Services will be conducted Friday in Aliquippa. Services for C. William (Bill) Grant, 55, of RD 1, Buffalo Mills, Pa., who died yesterday in Memorial Hospital from injuries received February 26 in a car-truck collision, will be conducted Sunday at 2 p.m. in the George Funeral Home by Rev. Ray Mallow. Interment will be in Rest Lawn Memorial Gardens. The accident occurred just inside the Pennsylvania line on Route 95 north of Ellerslie. Pennsylvania State Police said a pickup truck operated by Mr. Grant was struck headon by a car driven by Zane Lee Shagger, 20, of Hyndman. Police said the Shaffer vehicle, which was southbound, ran off the highway onto the berm, then crossed into the northbound lane and struck Mr. Grant's truck. Mr. Grant was born at Beryl, W. Va., and was a son of Charles R. and Eva (Burke) Grant, Cresaptown. He was employed as an iron worker and was a member of Local 568 Ironworkers' Union. Mr. Grant was also a veteran of World War II. Surviving are his widow, Lanna (Gibbons) Grant; a son, Donald H. Grant, Buffalo Mills; a stepdaughter, Mrs. Iona L. Skelley, Cresaptown; a stepson, Robert L. Carver, Florence, Colo.; five sisters, Mrs. Amelia Clayton, Cleveland, Ohio; Mrs. Mildred Combs, and Mrs. Verna Moon, both of LaVale; Mrs. Dorothy Shimer, National Highway; and Mrs. Pauline Flanigan, Cresaptown; a brother, Robert C. Grant, Cumberland, and five stepgrandchildren. Friends will be received in the funeral home today from 7 to 9 p.m. and tomorrow from 2 to 4 and 7 to 9 p.m.
Mrs. Carrie Virginia Grant, 88, native of Cresaptown, died today at Sacred Heart Hospital. She resided in Fairgo with a daughter, Mrs. Isaac Parker. Mrs. Grant was a daughter of the late John and Harriet (Sigler) Winters. She was a member of the Cresaptown Assembly of God Church. She is survived by three other daughters, Mrs. Sanford Robinette, and Mrs. Chelsie Liller, both of Cresaptown, and Mrs. Lester Beck, Lebanon, Fa. ; four sons, Leonard and Ray Grant, both of Lebanon, Pa.; Charles Grant, Cresaptown; and Marshall Grant, Brunswick; 40 grandchildren, 38 great-grandchildren, and 20 great-great-grandchildren. The body will remain at the Hafer Funeral Home, where services will be conducted Sunday at 2 p. m., with Rev. Ira Moore, pastor of the Cresaptown Assembly of God Church, officiating. Interment will be in Eckhart Cemetery. MEYERSDALE - Charles E. Grant, 92, Garrett, died suddenly yesterday at Meyersdale Community Hospital. Born in Okonoko, W. Va., he was a son of the late Lemuel and Susanna (Hyatt) Grant. His wife, Leona G. (Malcolm) Grant died last Sunday. Surviving are a son, Belmont Grant, Fairchance; five daughters, Mrs. Inez Fifick, Mrs. Thelma Lemhart, Garrett; Mrs. Emma Boyer, Cumberland; Mrs. Orpha Joyce, Mrs. Elizabeth Stouffer, Tarentum. He was a member of Garrett Church of the Brethren where a service will be conducted Monday at 2 p.m. Rev. Dean R. Shetler and Rev. Earl E. Meyers will officiate and interment will be in Highland Cemetery, Garrett. The body is at the Johnson & Son Funeral Home, Berlin. It will be taken to the residence where friends will be received after 4 p.m. today. The Rev. Charles R. Grant, 97, of 13513 Brant Avenue, Cresaptown, died yesterday in Sacred Heart Hospital. Born July 10, 1882, in Cresaptown, Rev. Mr. Grant was a son of the late John D. and Mary E. (McKenzie) Grant. His wife, Eva V. (Burke) Grant, died in 1974. Rev. Mr. Grant was a member of the Cresaptown Assembly of God Church, a former Celanese Fibers Company employee, and a retired Assembly of God minister. Surviving are five daughters, Mrs. Amelia I. Clayton and Mrs. Mildred L. Combs, both of Cresaptown; Mrs. C. Pauline Flanagan, at home; Mrs. Dorothy M. Shimer, Eckhart, and Mrs. Verna R. Moon, LaVale; one son, C. Robert Grant, this city; one sister, Mrs. Bertha Stottlemyer, Cresaptown; 29 grandchildren and six great-grandchildren. Friends will be received at the George Funeral Home from 2 to 4 and 7 to 9 p.m. today. Services will be conducted at 2 p.m. at the Cresaptown Assembly of God Church with the Rev. William M. Hoard officiating. Interment will be in Eckhart Cemetery. The body will be taken to the church one hour prior to the service. Pallbearers, all grandsons of the late Rev. Mr. Grant, will be Thomas Raley, Bobby Grant, Paul Flanagan, Donald Grant, Allen Shimer and Larry Moon. Frostburg, Feb 25 - Miss Frances Grant, 50, former resident and for many years a government employee, died Monday in Washington at Providence Hospital. She was a daughter of the late Mr and Mrs James and Mary Grant who resided on Frost Avenue. Miss Grant is survived by three brothers, Michael, Bernard and John Grant, all of Washington, and three sisters, Miss Rose Grant, Washington, and Sister Mary of the Eucharist, Baltimore, and Sister Olivene of Philadelphia. Burial will be in Washington. Mrs. Genevieve Marie Grant, 69, 217 East Main Street, Frostburg, formerly of Cresaptown, died today in Miners Hospital, Frostburg, where she was admitted February 28. She had been in ill health one year. A native of Eckhart, she was the daughter of the late Allan and Ellen (Radigan) McDonald. She was a member of St. Ambrose Catholic Church, Cresaptown. Mrs. Grant is survived by her husband, Charles S. Grant; two sons, Allan Grant, Frostburg, and Charles W. Grant, Sarasota, Fla.; three daughters, Mrs. Perley Bodkin, Mrs. Francis Williams, and Mrs. William Hayes, all of Hagerstown; one brother, John McDonald, Lincoln, Ky.; one sister, Mrs. Roger Murray, Cumberland. The body will be at the John J. Hafer Chapel of the Hills Mortuary, Braddock Road and Route 40, where friends will be received tomorrow from 2 to 4 and 7 to 9 p.m. The Rosary will be recited Sunday at 4 p.m. at the chapel. Rev. Carol Warner, OFM. Cap., pastor of St. Ambrose Church, will officiate. A requiem mass will be celebrated Monday at 9 a.m. at St. Ambrose Church and interment will be in the church cemetery. Funeral services for George D. Grant, 73, Baltimore Pike, who died Saturday, will be held at 2:30 p.m. Tuesday at Stein's Chapel. Interment will be in Rose Hill Cemetery. Rev. George E. Baughman, pastor of the First Methodist Protestant Church, will officiate. Luke, MD — James Grant, 76, of Mullen Ave., Luke, and most recently of Moran Manor Nursing Center, Westernport, passed away Sunday, November 16, 2014, at the nursing center. Born May 27, 1935, he was the son of the late William F. and Catherine E. (Ball) Grant. He was also preceded in death by two brothers, William Grant and Robert Grant, and a sister, Anna Grabenstein. Mr. Grant was a United States Army Veteran, having served during the Korean War. He retired from Westvaco Corp. He leaves behind a sister, Doris Garvey of Cranberry Township, PA, a sister-in-law, Betty Grant of Baden, PA, and a brother-in-law, Charles Grabenstein of Connecticut. At his request, his body was cremated. A graveside memorial service will be held at Philos Cemetery, Westernport, on Friday, November 28, 2014 at 1:00 PM, with Rev. Steve Grimes officiating. Boal Funeral Home, Westernport is in charge of arrangements. James Leroy Grant, 83, of 236 East Chestnut Street, Cleona, Pa., died January 14 in Lebanon Valley General Hospital. A native of Cresaptown, he was a son of the late Joseph and Carrie (Winters) Grant. His wife, Grace I. Grant, preceded him in death. A retired textile worker, he was a member of Trinity United Methodist Church. Surviving are three children, James L. Grant, Hagerstown; Mrs. Marilyn Fortna and Mrs. Naomi Emerick, Lebanon; two sisters, Mrs. Ethel Park and Mrs. Lillian Beck, Cumberland Fairgrounds; two brothers, Charles Grant, Frostburg, and Marshall Grant, Rawlings; seven grandchildren and three great-grandchildren. John D. Grant, 75, a farmer of Cresaptown, died this morning at his home. Mr. Grant is survived by two sons, John and Richard Grant, both of Cresaptown, and by five daughters, Mrs. Scott Chilott, Mrs. James Stottlemeyer, Mrs. John Stottlemeyer, and Mrs. Edward Carpenter, all of Cresaptown, and Mrs. Howard Darr, Frederick, Md. Funeral services will be held at 10:30 a. m. Thursday from the Cresaptown Church, with burial in the Cresaptown cemetery. Leonard W. Grant, 70, of 1617 Centre Street, Lebanon, Pa., formerly of Cresaptown, died Saturday in a Lebanono hospital. He was born October 2, 1885, a son of the late Joseph and Carrie Grant. Survivors include his widow, Mrs. Mary (Lehman) Grant; three brothers, Charles Grant, Frostburg; Roy Grant, Lebanon, and Marshall Grant, Rawlings; and four sisters, Mrs. Lena Robinette and Mrs. Mary Liller, both of Cresaptown; Mrs. Lillian Beck, Lebanon, and Mrs. Ethel Parker, Fairgo. Services and interment will be conducted Wednesday afternoon in Lebanon. Frostburg, Md., July 21.—Sister M. Alverna, daughter of the late James and Mary Grant, former residents of Frostburg, died July 18 at Mt. St. Joseph's Academy, Chestnut Hill. Philadelphia, Pa. She was a member of a religious older for the past twenty-two years. Surviving are the following sisters and brothers: Sister M. Olivine, Philadelphia, Pa.; Sister Mary of the Eucharist, Baltimore; Michael, John, Bernard, Mary, Frances and Rose Grant of Washington, D. C. Miss Rose Grant, who was on her way to visit her sister before she died was in an auto crash enroute, sustaining severe cuts and injuries about the head. Funeral services for Sister Alverna took place this morning from the convent chapel in Philadelphia with burial in the Chapel cemetery. Westernport, MD — Mary Bernadine (Kolberg) Grant, 104, formerly of Maryland Ave, Westernport, and most recently of Egle Nursing and Rehab Center, Lonaconing, passed away Saturday, April 13, 2013 at the nursing center with her nieces and nephew by her side. Born January 25, 1909 in Westernport, she was the daughter of the late William and Magdelene Jane (Haning) Kolberg. She was also preceded in death by her husband Robert S. Grant, and four brothers, William “Babe”, Elmer “Tillie”, Edgar and Paul Kolberg. She was the last survivor of her immediate family. Mary was a member of St. Peters Catholic Church, Westernport, and Westernport Senior Citizens. She had a long and happy life and will be missed by all especially her nieces, Judy Cline and husband Jerry, Mary Ann Cowles, and her nephew, Robert Kolberg. She also leaves behind many other nieces and nephews, and her close friends, Barbara Brown and Diane Amann. As per Mary’s wishes, there will be no visitation or funeral service. A graveside service will be conducted at the Philos Cemetery, Westernport, on Wednesday at 11 a.m., with Father Edward Hendricks officiating. The family extends a heartfelt thanks to the staff and Egle Nursing Center for the compassionate and loving care given to Mary during her stay there. In lieu of flowers, memorial contributions may be directed to St. Peters Catholic Church Bereavement Committee, or the Egle Nursing and Rehab Center Activities Fund. Boal Funeral Home, Westernport, is in charge of arrangements. Condolences may be sent to the family at boalfh.com. Mrs. Mary E. Grant, 79, widow of John D. Grant, died yesterday morning at her home in Cresaptown. She is survived by the following children: Mrs. H. S. Chilcott, Richard Grant and Mrs. James Stottlemeyer, Cresaptown; Mrs. Howard Darr, Frederick, Md. ; Mrs. Edward Carpenter, Philadelphia, Pa.; Mrs. John Stottlemeyer, this city, and John Grant, of Philadelphia. Funeral services will be held at 2:30 o'clock tomorrow afternoon at the Cresaptown Methodist Episcopal Church, with interment in the church cemetery. Mrs. Michael Grant died December 30th at the home of Mrs. J. Hogan in Piedmont, at the age of 52 years. Mr Patrick Grant died at his home at Westernport on Thursday night about 69 years. He was born at Meighfoner, Parish of Mullabawn, County Armaugh, Ireland. At the age of 16 he went to Whittenpark County, Durham, England and worked in the mills there. At the age of 20, he married Rosa Louth, who died about one year ago. Mr Grant located in this county in 1859 and was employed as mine boss for the Davis Coal Co at Franklin for a period of 23 years or until he resigned 7 years ago. He then moved from Franklin Hill to a home he bought and beautified on Westernport Hill. The deceased is survived by one brother, James of Frostburg and six children, viz: E R Grant of Midland; M F Grant, P A Grant, Mrs Elizabeth Flanigan and Misses Mary and Rose Grant, all of Westernport. Mr Grant was a citizen who had the confidence and esteem of all who knew him and during his long residence in the country became acquainted with a large number of people in the surrounding territory of his home. He was frugal in his habits and as honest as the day is long. "A noble man is gone" is the expression one hears from the lips of those with whom he associated. Verna Ruth Grant, at home. He was a member of the Pentecostal Church. Robert Howard Grant, 58, of Moran Manor, formerly of 101 Mullen Ave., Luke, Md., died Friday, Nov. 14, 2003, at Sacred Heart Hospital in Cumberland. Born Feb. 18, 1945, in Keyser, W.Va., he was the son of the late William F. and Catherine E. (Ball) Grant. He was preceded in death by one brother, William Grant. He is survived by one brother, James Grant of Luke, Md. ; two sisters, Doris Garvey and husband Thomas, of Cranberry Township, Pa., and Anna Grabenstein and husband Charles, of Branford, Conn.; one sister-in-law, Betty Jean Grant of Baden, Pa.; along with nieces and nephews. At the family's request, there will be no visitation. A graveside service will be held Monday at 2 p.m. at Philos Cemetery, Westernport, with the Rev. Bart Thompson officiating. David Elmer Grapes, 65, of 408 York Place, died yesterday at Memorial Hospital after an illness of several months. A native of Keyser, he was a son of the late Elkana and Polly D. (Smith) Grapes. He was a retired carpenter and was a member of Memorial Heights Baptist Church. Surviving are his widow, Evelyn Mae (McCray) Grapes; two sons, David E. and Richard L. Grapes, city; six daughters, Mrs. Helen Heaton, Miss Dorothy Grapes, Mrs. Edna Wilson, Mrs. Clara Crites, Mrs. Patricia Benson, city, and Mrs. Eleanor Shelley, Lanham; three brothers, Homer and Floyd Grapes, city, and Howard Grapes, Baltimore; five sisters, Mrs. Pearl Heavener, Mrs. Maggie Powell, city; Mrs. Effie Rader, Oldtown; Mrs. Bertha Cook, Cresaptown, and Mrs. Delia Kuykendall, Baltimore; 23 grandchildren and 10 great-grandchildren. The body is at the Scarpelli Funeral Home where friends will be received today from 7 until 9 p.m. and tomorrow from 2 until 4 and 7 until 9 p.m. Services will be conducted at 2 p.m. Friday in the funeral home by Rev. Cecil S. Smart. Interment will be in Davis Memorial Cemetery. The family requests expressions of sympathy take the form of contributions to the Cancer Society. A little child of Robert Grapes, aged five months, died Monday night and was buried Wednesday morning. The services were conducted by the Rev. R. G. Hammond. Friday morning Frederick Grasser, of near Forwardstown, Somerset county, was caressing a frisky two-year-old colt when the animal suddenly wheeled and kicked Mr. Grasser in the left side, crushing his ribs The injured man died an hour afterward. The deceased was a well-to-do farmer, forty-two years old. His mother, Mrs. Catharine Grasser, lives at New Baltimore. A brother, John Grasser, of Forwardstown, and seven sisters also survive him. Among the latter are Mrs. Annie Hillegas, of Mann's Choice, aud Mrs. George Imgrundt, of near New Baltimore. Mr. Grasser's wife is at the hospital for the insane at Dixmount. Mrs. Bertha May Gray, 73, of Potomac Park died yesterday in Washington Sanitarium, Takoma Park. Born January 11, 1896 in Corriganville, she was the daughter of James and Flora (Witt) Lowery. She was preceded in death by her husband, Carl E. Gray. She was a member of Barrelville Presbyterian Church. Surviving are two sons, Ralph E. Gray, Silver Spring, and Robert C. Gray, Takoma Park; two daughters, Mrs. Wayne Smith, Gaithersburg, and Mrs. Donald Nigh, Mt. Savage; three brothers, Clarence Lowery, Raymond Lowery and George Lowery, all of Corriganville; three sisters, Mrs. Grace F. Holt, Barrelville; Mrs. Raymond Hosselrode, RD 1, Hyndman, and Mrs. Fairy Morgan, Barrelville; 12 grandchildren and five great-grandchildren. The body will be at the Zeigler Funeral Home, Hyndman. A service will be conducted at Barrelville Presbyterian Church tomorrow at 2 p.m. Rev. Alex N. Nemeth will officiate and burial will follow in Mt. Savage Methodist Cemetery. The body will be taken to the church at 1 p.m. tomorrow. "Mr. Edward M. Gray, 79, of 38 Orchard Street, died yesterday at Allegany Hospital where he was admitted May 13. He was a native of Cumberland. For many years Mr. Gray sold refreshments at athletic contests. Surviving are two brothers, Samuel and Thomas H. Gray, and two sisters, Mrs. Theodore Chaney and Miss Lettie Gray." George E. Gray, 18 years old, of Meyersdale, died yesterday morning at the Western Maryland hospital in Cumberland. The body was shipped to the Gray home at Meyersdale. A terrible accident occurred last Tues morning, a few miles above Keyser, in which three men lost their lives and one is lying in a critical condition. The dead are D. W. Eagle, a well known business man, a farmer, a sawmill man and interested in many other enterprises around here; John Smith, aged 20 years; and John Gray. The injured man is Jos Boyce, who has a leg and arm broken and hurt about the back, and it is feared that he too, will die. Mr Eagle's son was also with the men, but escaped injury. The men were starting an old saw mill that had not been run for some time. In some way the boiler exploded. Smith was killed outright, Mr Eagle died just as they reached the hospital with him, and Gray died the next morning. Eagle was crushed about the head and chest. Two other men were standing near, but both escaped without injury. Olin, Mr Eagle's oldest son, was standing within a few feet of his father. Alex Shears, the fireman, who escaped, says there was only forty pounds of steam in the boiler at the time. They were all standing together watching one man lace a belt at the time. The men were all buried at the Duling church, Smith Wed, Gray Fri morning and Eagle yesterday afternoon. Mr Eagle was a member of the New Creek Council National Union, who had charge of the funeral, many of them attending. Services were conducted at his late home by Rev A P Neel. Mr Eagle was a native of Pendleton County, and was 49 years, 8 months old. He married Miss Annie E Burkhiser, who with two sons, Olin and James, survive. He leaves three brothers, George of New Creek and two in the west, and one sister, Mrs Taylor Delay, of Petersburg. "Mrs. Margaret [nee Himes] Gray, aged 84, died at the home of her daughter, Mrs. Theodore Chaney, 31 Wine street, this a.m. at 5 o'clock. The cause of death was old age. She is survived by five children, Messrs. Thomas, Samuel, Edward, Mrs. Chaney, and an unmarried daughter, Miss Lottie, all residents of this city. Mrs. Gray was a remarkable old lady and had a host of friends. She came here from her native county of Frederick, Md., years ago, and has made her home with her son-in-law, Theo Chaney, for the past 26 years. Last week she was admitted into the communion of SS Peter and Paul's church and her interment will be made in Rose Hill cemetery at the side of her daughter-in-law, Mrs. Samuel Gray. The hour and details of the funeral have not been determined." "Thomas H. Gray, 81, of 29 Orchard street, died last night at Allegany Hospital, three hours after being admitted. He was a retired railroad conductor. Surviving are three sons, Earl and Harry Gray, Chicago; Thomas Gray, Cumberland; two daughters, Mrs. Vivian Parker and Mrs. Harry Abbott, this city; a brother, Samuel Gray, Cumberland; sister, Mrs. Theodore Chancy[sic-Chaney], LaVale; nine grandchildren and two great-grandchildren." "Thomas Theodore Gray, 59, of 55 Greene street, retired city fireman, died this morning in Allegany Hospital where he was admitted late last night in a semi-conscious condition. He collapsed at his home. Mr. Gray was a member of the City Fire Department for 25 years. He retired eight years ago and more recently had been employed as night watchman by the Potomac Edison Company. He belonged to St. Patrick's Catholic Church an Cumberland Aerie No. 245, Fraternal Order of Eagles. Besides his widow, Mrs. Mary (Mills) Gray, he is survived by three children, Theodore Gray and Mrs. Virginia Bonig, this city, and Mrs. Leonard Paggi, of Austin, Texas, and three grandchildren. The body will be taken to the home tomorrow morning. The family requests that flowers be omitted." "A requiem mass was held this morning in St. Patrick's Catholic for Thomas Theodore Gray, 59, of 55 Greene Street, who died last Thursday in Allegany Hospital. The Rev. Father Charles W. Bogan officiated and interment was in the church cemetery. Mr. Gray was a former member of the City Fire Department and the pallbearers were Harry Mcnabb, Roy Miller, William L. Linder, Vincent Wegman, Paul Reed and Grover Crawford, all firemen, with the exception of Crawford, who is retired." "In memory of Thomas W. Gray, who passed away October 31, 1957. He had a nature you could not help loving. And a heart that was purer than gold. And to those who knew him and loved him, His memory will never grow cold. Cleona Gray McMillan and family." The three months old twins of Mr. and Mrs. Lawrence Grayson, were buried last Monday afternoon. Reginald died Sunday morning and Richard died Sunday night. The funeral services were conducted by Rev. J. H. Brunk. Mr. and Mrs. Grayson reside on Sharless (?sic). Mr. Frank Clary of Deer Park and Mrs. J. F. Grayson of Cumberland attended the funeral services, also Miss Alma Grayson and her brother Ernest, of Antioch.